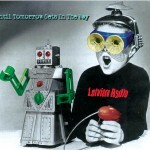 The new Latvian Radio album “Until tomorrow gets in the way” is now ready and released. It blends straight up power pop, UK post punk, new wave and lush ballads, and has already gotten a great review in US magazine The Big Takeover. Their 2014 release “For love & spite” ended up on 5 different best album of the year lists, including a top 10 finish in Absolute Powerpop. The new album can be found at any decent music outlet you prefer. Latvian Radio will be playing live at 123 Pleasant St in Morgantown, WV Friday May 6th together with The Phantom Six and Hello June. Get over there and check out the new songs!